A British military dog killed in a grenade attack in Afghanistan will be posthumously awarded the PDSA's Dickin Medal for bravery. Four-year-old Labrador Sasha served with the Royal Army Veterinary Corps, attached to the 2nd Battalion The Parachute Regiment. She was credited with saving scores of lives by sniffing out mortars, hidden weaponry and Improvised Explosive Devices (IEDs). 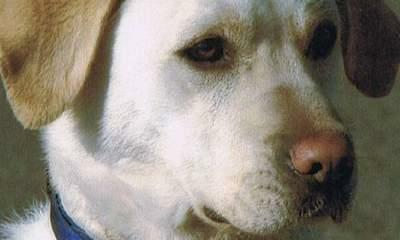 Sasha was killed in Afghanistan alongside her handler, Lance Corporal Kenneth Rowe, in July 2008. Lance Corporal Rowe, 24, and Sasha died when their routine patrol was ambushed and struck by a rocket-propelled grenade attack. An inquest later heard that Lance Corporal Rowe, from West Moor near Newcastle, died the day after he was due to return home. He chose to stay on to complete a planned operation because he was concerned about a lack of cover for his comrades. The PDSA says Sasha is the 65th animal to receive the Dickin Medal since the award began in 1943. The honour is the highest that an animal can receive while serving in a military conflict. PDSA Director General Jan McLoughlin said: "We are extremely proud to be awarding a posthumous PDSA Dickin Medal to Military Working Dog Sasha. "The award is even more poignant as we approach the centenary of World War One and are reminded of the huge debt we owe the animals who serve in times of conflict. "Sasha's exceptional devotion to duty in Afghanistan saved many lives, both soldiers and civilians. "This medal, recognised worldwide as the animals' Victoria Cross, honours both Sasha's unwavering service and her ultimate sacrifice."